What games are you digging right now? I'm curious what folks around here are enjoying right now. Let's hear it all—tabletop RPGs, board games, single- and multiplayer video games, VR games, exercise games, mobile games, whatever. Marvel Puzzle Quest. A simple and free "match-3" mobile game, like Bejeweled, with some collectible-card-game features and plenty of comic book heroes to geek out over. I've kicked them some money from time to time for in-app purchases, but it's purely optional. I really appreciate that you can get by just fine without spending a dime, and it makes a pleasant morning ritual to get the brain going. The King Machine. A tabletop RPG about intelligent primates who live in a fantastical world where a machine always chooses a perfect king to rule them (until it doesn't). I appreciate that it takes advantage of a range of my funny-shaped dice, and defines the highest level of success as one where nobody loses—a nice alternative to games where a "critical hit" means hurting somebody as badly as possible. I'm planning on running this online soon for players in The Gauntlet, an online gaming community. Into the Odd. Another tabletop RPG, I think of this one as kind of a super-pared-down Dungeons & Dragons, stripped down and rebuilt to eliminate the parts of the game where you're puzzling over arithmetic or waiting until it's your turn. I've run a few sessions over the last several months, and have also been spending time hacking the rules for my own games, which I'm writing about over on my game design blog. The Legend of Zelda: Breath of the Wild. In truth, I haven't touched this game in months, but it's the main reason we bought a Nintendo Switch, and I am determined to get back to it. Now that we have a handy little carrying case and I even wrote "Play Nintendo" on my to-do list to remind me to make time for fun (! ), maybe I'll finally get back into it. So: What are you playing? At the moment, I really enjoy the Eternal card game. 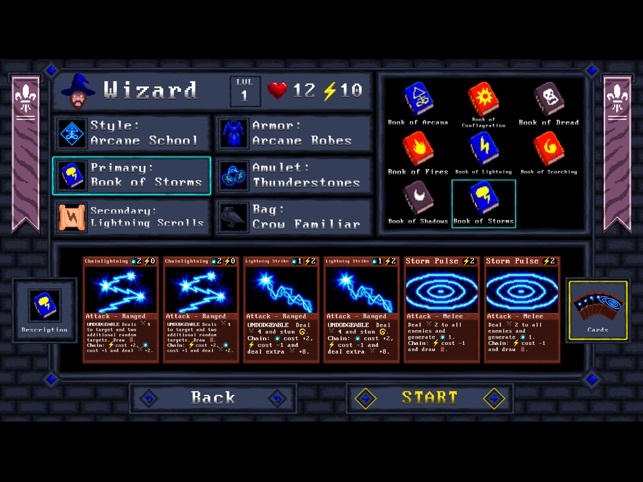 It is available both on Steam for PC as well as on mobile (Android/iOS), and is a free-to-play card game similar to Magic the Gathering but with some mechanics that only work in a digital space (like transforming cards into others, or certain card draw mechanics). I mostly play video games, but every now and then will dabble with a tabletop game. Words With Friends - Chances are if I'm looking at my phone, I'm playing this. The only downside is all my friends don't play it as much as I do so I'm always waiting forever for my next turn. Scrabble - Can't argue with this classic. It's our go to board game if we're feeling like a quiet night is in order. Blokus - This is a super fun and quick game but you need 4 people to play. It's kind of like reverse Tetris in that you want to get all of your blocks/shapes on the board. Red Dead Redemption 2 (PS4) - This game is incredible. I haven't gotten too far in it yet since it seems like it requires super long sessions for me to get sucked in, but when I have some time to do it, I love it. No Man's Sky (PS4) - I'm always kind of playing this game in some capacity. It comes in spurts. I'll play it for a while then take a break, and then come back to it again. It's probably the longest running game experience I think I've ever had. Looking for the next Switch game to play - I love the Switch as a console, but the title selection is still pretty slim compared to other consoles. I've played all the staples (Mario Odyssey, Zelda, Mario Kart, Skyrim, Stardew Valley) and so I'm looking for the next game that will capture me. I hear there's a new Pokemon game out so I've thought about looking into that. There's also a myriad of smaller pixel-style games that look interesting (Celeste, Dead Cells). Breath of the Wild is so great :). I've been meaning to go back and replay it. I'm in a similar boat where I have had to reorganize my game playing pursuits after having a kid. Tabletop games have unfortunately gone by the wayside. It's a bit harder to get together with friends to play now, and difficult to just leave a game open due to probing hands and paws. Sadly, there are a bunch of games sitting on our shelf waiting to be opened 😭. As far as videogames go, I've been able to stay up a bit later and get up a bit earlier for a chance to play. Most recently I finished playing through Red Dead Redemption 2. It is a long one but I feel like every aspect of it is a lot of fun. Thematically I find it really fun to run around as an honorable bandit, robbing the rich and helping the poor. The story and character development is also really great. I also find that it is fun just getting to wander around an experience the game as there is so much life everywhere and so many things to do. I liked riding around on a horse so much in RDR2 that I decided this past week to pick up The Witcher 3: Wild Hunt. The last time I tried to play it I got bored because the game gets a bit too easy if you like to finish all the side quests. This time I tried setting it on the hardest "Death March" setting, and so far I'm finding it challenging enough. I actually find it scary when I come across monsters higher level than me, and I have to engage more of the preparation aspects of the game like picking the right oil for my weapons and potions. Another one I'm playing on the is Pokemon: Let's go Pikachu!. I grew up playing the first Red and Blue games, and this is essentially a direct copy of them (ok yellow really but I didn't play that one) with updated graphics and mechanics. The biggest change to the mechanics is that you deal with wild pokemon purely by throwing pokeballs at them, just like Pokemon Go. I think this is more thematically correct, and a whole lot more fun than the endless grind of murdering poor little creatures in the bushes for experience. How did you like Skyrim for the switch? I played it for computer when it first came out but maybe it's worth a retread. I feel like it might be worth it if they changed the archery to work like Zelda where you can tilt the screen for precision aiming. Skyrim was really cool at first. I had never played it on another console, but got pretty into it on the Switch. I actually never even beat it though. I played it for a long while got a little bored with it eventually. I think I was a little spoiled by Fallout 4 which is essentially the same game engine but in a much richer universe (I thought). I felt like Skyrim suffered from not enough variety between one dungeon and the next. But it's still a fun game if you're into the Bethesda game mechanics. I can't remember if the archery lets you use tilt control or not. I want to say yes, but I'm not sure. Are you liking the new Pokemon? I loved the old Game Boy versions so I was eyeing this new one as maybe my next game to play. Yea! If you liked the Red / Blue / Yellow you will definitely like this one. I never played Yellow but from what I understand it is basically identical in terms of story / map layout. And Yellow was a carbon copy of Red / Blue but you start with Pikachu instead of the normal 3 starting pokemon. I think my least favorite thing about the older games was having to grind wild pokemon, and you would constantly run out of PP from doing that too. Now it's all about aiming and throwing pokeballs. If you are in handheld mode you use tilt control like zelda to aim, and if you are in console mode you swing the joycon in the direction you want to throw. It's the same 150(1?) pokemon from the original too, which is fun to remember a lot of the old ones. Some of the newer types are in there, like a couple of the electric are also steel (I don't think steel was in the original?). You can also trade some of the originals for their variations, like you can trade an original geodude (rock/ground) for the variant (electric/rock). I've been invested in quite a few games over the past few months, both old and new. XCOM 2 - Another turn-based strategy game where you fight against aliens, but this time you control a squad of elite soldiers with advanced weaponry. Rocket League - Football with cars. Played this a few years ago, then forgot about it, then recently got back into it. They Are Billions - A very good RTS game where you build a colony and fight off huge zombie hordes. They just added a map editor so the community can make custom maps, and it made the game so much better. Hitman - Just started playing this game, and I love it. I played the older games back in the day, and I love that the franchise was rebooted. I'm currently enjoying Equilinox, an indie game about creating biomes, unlocking and evolving creatures that is pretty relaxing. This is a weird thing to gush about but the UI is so smooth, I freaking love it! Tabletop Roleplaying Games: I'm enjoying being in a playtest for an Eberron capsule adventure for Dungeons and Dragons, but that isn't widely available yet! I was recently at a RPG con where I mostly played an extremely old diceless RPG, but I did sign up for one intriguing unfamiliar game that I really ended up liking: it's a very freeform storytelling heist game, set in a modern city undergirded with magic and blood. The specifics of the city emerge as you tell the story and set up your heist; and what you're stealing is...magical power. An archetype. An identity. Specifically? A Tarot Major Arcanum. You make your character on the spot from the barebones descriptions of the available 'nobles' (the page, knight, queen, king of each Tarot suit.) I think the three of us who picked our noble at random actually ended up with the richest experience! For this kind of game, you really need creative players who are willing to go out on a limb and trust that the next player will reach out and catch them -- but our heist ended up being amazing, and the inter-character drama achieved epic proportions. It was a PERFECT ONE-SHOT, and quite replayable. I'm definitely going to buy and print the PDF -- the $10 pdf gives you all the printed materials, and add a tarot deck and some tokens and you're ready to go. (You can play this on iPhone, but you'll squint a bit for card text. I play it on iPad.) If you require pretty graphics, do NOT play this game: it has a sort of early-90s pixelated graphic style that relies a bit on nostalgia. It's a deck-building game, like Ascension or Dominion -- a small, cycling deck -- that has been called a 'roguelike'. Yeah, you heard that right. It's a very interesting and challenging game, and despite the primitiveness, the graphics do have a certain charm. There's no save and restore -- just continuing a suspended game -- so death is final. You end up trying a lot of different builds and strategies, and it's interesting to have one class very kitted out and still be trying to get any goodies at all with the others! Other than that, I'm sort of in a rut right now: I play Hearthstone on the iPad while I run on the treadmill, and Overwatch on the PS4 whenever I pick up a controller. Blizzard everywhere! But I'm thinking of picking Dragon Age 3 back up to try to finish the main quest, now that everyone's talking about DA4! I've been trawling around for ideas. I've just received a copy of The King Machine mentioned by @JasonT it is a very interesting system and I would like to try a game but I don't think that will happen. I've also been looking at diceless games because I have an interest in systems. I found this page http://www.dyasdesigns.com/roleplay/dicelessgames.html and I have been playing with adapting some of the attention points mechanism from The Delta System for use with our current GURPS games and its mob of attention deficit Ellyon. I've noted the link to Royal Blood provided by @Felicity, I think I will have to buy a copy just to see what it is like. In the past I have used tarot cards to create instant scenarios but this also looks interesting. I am likely to run either The King Machine or Sand Dogs online sometime next month through Gauntlet Hangouts! Also, for diceless games, I recommend checking out Dream Askew (there's a free copy online and a newly expanded kickstarted version too) and Diceless Dungeons (which is basically oldschool D&D resource management distilled to its essence, which I am fascinated to try sometime). Thanks for the invite Jason but I'm at UTC+8 so it isn't likely that I'll be able to participate. I'll have a look at Dream Askew too ... I'm not specifically looking for diceless rules but I'm always interested in what is out there.